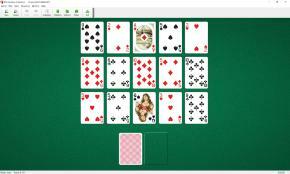 Empire Solitaire requires only 18 cards out of a standard deck of 52. The remaining cards are set aside and not used in the game.15 cards are dealt face up in 3 horizontal rows (not overlapping) of 5 cards each. The remaining 3 cards are placed face down in a stack. To get all your cards in a single stack, by placing cards on top of others with the same suit or rank. You may place any card on top of any card adjacent to it (including diagonally) with the same rank or suit (thereby "conquering" it). Once a card has been conquered, it is out of play. In addition to immediately adjacent cards, a card can be conquered if it is the same row or column and there are no cards between the card being played and the card being conquered (this is analogous to the movement of the rook in chess). It is not necessary to work with only a single stack. 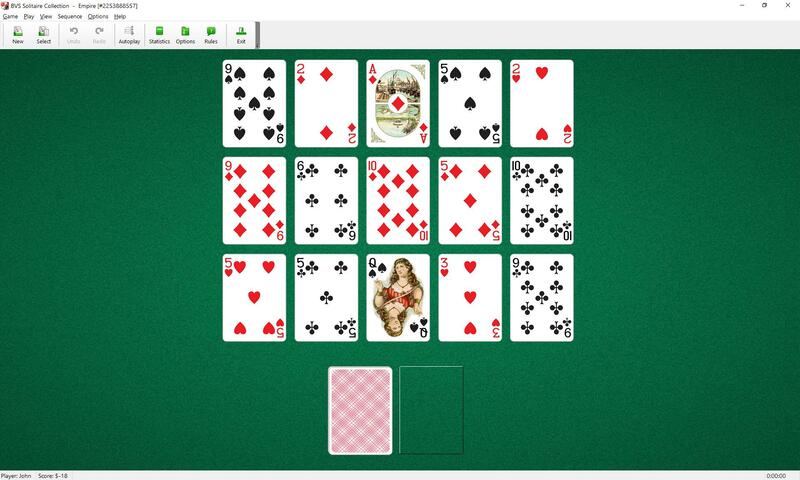 For example, you may conquer the card in row 1, column 1 by the card in row 2, column 1, then in the next move, conquer the card in row 2, column 5 by the card in row 3, column 4. Play continues in this fashion until there is only one stack of cards containing the entire set (or a single card remaining on the board if conquered cards are being removed from play). Though the game is very simple to play, it takes some strategic planning to win. Conquering cards with no forethought will quickly deplete you of options. The layout of cards on the field should be studied carefully before any moves are made. If there is only one spade on the board, for example, that card can only be conquered using its rank, unless a spade is uncovered in the reserves. If the lone spade is conquered, and later a reserve is turned over that is also a spade, you may not be able to conquer that reserve card, unless it shares a rank with another card on the board. Generally, reserves should be used about midway through the game. Used too early they probably won't provide any real assistance. Used too late and you may not be able to conquer them. If you get stuck, placing a reserve in a strategic location can help. Try to keep cards of the same rank on the board as long as possible. Three (or even four!) cards of the same rank is ideal. They can each move around the board conquering cards by suit, then later can conquer each other using rank. This game was invented by Jim Owen.